It was announced today that the Rangers have re-signed Jimmy Vesey to a two-year bridge deal with an AAV of $2.275m. Any normal person will look at that and say: "Fine." and that's about it. I'm not normal. I've never been totally convinced that Jimmy Vesey would amount to anything more than a third-liner in the NHL. More often than not, players who spend four-years in the NCAA and enter the NHL at age 23 don't fare well in the pro-game. I expected more of the same from Vesey. To his credit, Vesey has actually outperformed my expectations from him. If you would've told me that after two years, Vesey would have 33 NHL goals, well, I'd be pretty surprised. Now, not to discredit Vesey's goal scoring ability, which he's shown, but the rest of his game is, utilizing shot attempt metrics and xG... bad for a player who gets the ice time that he gets. Which begs the question, well, where is Vesey's on-ice utility that earned him these 1900 minutes across two seasons, and a bridge contract that saw him get a raise? I'm not seeing it. My hypothesis is that the best part of Vesey's game is his play within 10ft of the opposition net. Luckily for this project, I have scraped the 2017-2018 season from the NHL, and we can take a look. Last year, Jimmy Vesey had 187 individual unblocked shot attempts. Of these 187, 32 were within 10 feet of the opposition net. I was pretty shocked by this number, expecting it to be way higher. Now, to be fair, 10 feet is an arbitrary number that I used. 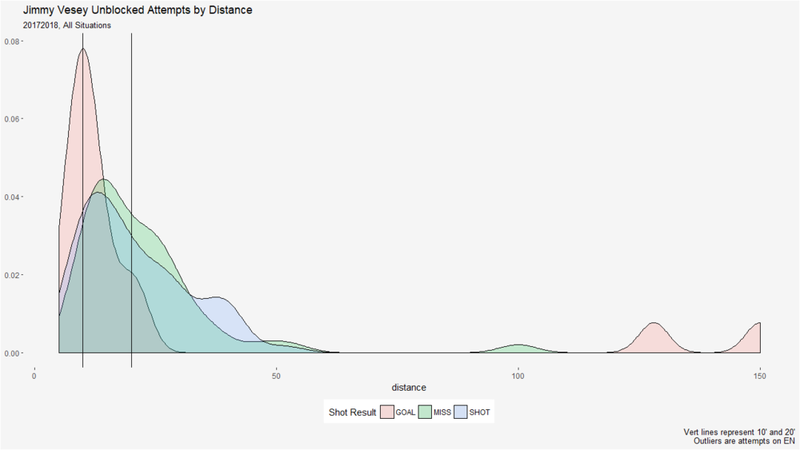 I'm actually not totally certain what the 'optimal' distance to use is for a net-front performance analysis. Any tips? I'm sticking with 10. But we carry on. If we set the cutoff to a minimum of 20 attempts from 10 ft or less, we get a sample size of 182 players (this is now all situations). Using this sample, Vesey ranks T-59th in total unblocked attempts, T-33rd in goals scored, and 34th in unblocked shot attempt %. Ultimately, not terrible. 128 (ENG), 13, 12, 12, 21, 11, 21, 150 (ENG), 17. Again, showing the arbitrary cut of 10ft might not have been generous enough. Because if we open that to 15, we get 12 of Vesey's 17 goals from that distance. Doesn't really help without context, so let's compare to someone a lot of people consider to be a 'floater', Pavel Buchnevich. These charts are very obviously different, again leading us to believe that Vesey does do a job close to the net. For context, Buchnevich also had 32 unblocked attempts from ten feet or less but only scored on 6 of them. The conclusion here is basically that Vesey is for lack of a nicer term, a bad player who gets the minutes that he does. His perceived utility is that he's often in front of the opposing teams net, which seems to be true via the density plot, and is a good, but not great or elite finisher of these attempts. However, good enough to see if he can sustain this type of playstyle, and maybe get luckier and finish more of the attempts that he gets from there. Probably exactly why Vesey was worthy of a bridge-deal. And thus fully concludes spending way too much time on something that probably didn't need to happen.